A scholarship endowment, named in honor of Thaddeus John Bell, M.D., recently reached the $250,000 mark. This major milestone allows $10,000 to be divided between two African–American students enrolled at MUSC. Bell, who served as the director of the Office of Diversity and associate dean for diversity in the College of Medicine, retired from MUSC in 2010, but continues to take an active interest in the future of its students. “This scholarship is a dream come true for me as a result of being a student, professor, an administrator at the Medical University and physician in private practice. I’m hoping the students who are selected as recipients will commit themselves to service to the community and help decrease health disparities as I have throughout my life,” he said. To celebrate this accomplishment, friends of the fund gathered for a reception on Feb. 20 at MUSC. U.S. Congressman Rep. Jim Clyburn will be the guest speaker. During the festivities, Bell will announce plans he has to make a major gift to the fund. Bell is a family practice physician in Charleston and one of the state’s leading crusaders in the fight to reduce health disparities. The fact that South Carolina is ranked 47th in the nation is a bone of contention for him. Bell believes more African–Americans are needed in all health care professions and hopes, through this scholarship, recipients will take an interest in combating the inequities so many in the state experience. According to Bell, African–Americans make up less than 4 percent of the physician population in South Carolina and yet they represent 35 percent of the overall population. Also, most African–Americans prefer going to a health care provider that has a cultural background similar to theirs, Bell said. His efforts are aimed at increasing that number. “When I was the director of the Office of Diversity, I became acutely aware of how badly African–American students needed financial support to help them get through. Most of them are first–generation health care professionals. They have the talent, intellectual gifts, just not the funds. If I can provide funds to make that happen, that’s what I want to do,” he said. Sabra Slaughter, Ph.D., chief of staff of the MUSC President’s Office and a leader himself in the study of health disparities, supports Bell’s work. “Health care and access to care are impaired, in part, by an inadequate supply of health professionals. This shortage is particularly problematic for African–Americans, other ethnic minorities and underserved populations in South Carolina,” he said. “The Thaddeus John Bell Scholarship addresses this issue by increasing the number of African–American health professionals, across all disciplines, in South Carolina. Moreover, the amount of the endowment allows it to offer scholarships in perpetuity. This is a major win for MUSC, its students, and the state of South Carolina,” Slaughter said. 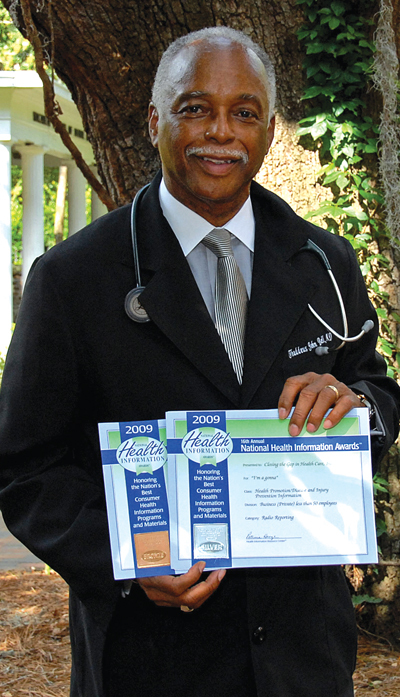 In 2004, Bell founded Closing the Health Gap in Health Care, Inc., a Lowcountry nonprofit organization dedicated to increasing African–American healthcare providers while decreasing health disparities and increasing health literacy among underserved African–American communities in the Tri–county area and throughout the state. According to Bell, one of the main reasons these disparities exist is a lack of health literacy. His organization provides health education and programs that promote wellness and healthy lifestyles. Five to six times daily, Bell can be heard on radio station Magic 107.3 or on the local Fox TV affiliate sharing health tips in a culturally sensitive way that is appreciated by the African–American community, Bell said. His fund has grown steadily with support from major partners such as MUSC, local hospitals, pharmaceutical companies and Bell’s family, friends and colleagues. Additionally, proceeds from the Lowcountry Jazz Festival, a yearly event that Bell and his wife, Cynthia, brought to fruition have gotten them to the quarter–million dollar mark. With the extra financial push from the festival, the first scholarships will be awarded in 2014. The endowment, located at the Coastal Community Foundation of South Carolina, is currently accepting applications which must be submitted by March 25. He also hopes the recipients will be encouraged to get involved in the community and help eliminate health disparities as he has done his professional career. “My ultimate goal is to see this endowment reach $1 million. I look forward to the day when all six colleges have their own recipient,” Bell added. http://www.coastalcommunityfoundation.org or call 723-3635. For information on the Lowcountry Jazz Festival, visit Lowcountryjazzfest.com.